Keep that New Year’s resolution to get in shape! Zumba resumes next week with Monday (January 11th) & Wednesday (January 13th) classes at 7pm. Zumba Gold resumes the following Tuesday (January 19th) at 10am. Each class is only $5. Due to the road conditions, there will be no Zumba tonight, Wednesday, March 18th. Tonight’s (March 9th)Monday night Zumba and tomorrow morning’s (March 10th) Zumba Gold class have been cancelled this week. We apologize for the inconvenience. Zumba class on Wednesday, February 18th will be held at 8pm rather than 7pm to accommodate our Ash Wednesday Mass. Because of the drifting snow, Zumba class tonight, February 16th, and Zumba Gold class tomorrow morning, February 17th, have been cancelled. Zumba Gold classes have started again for the fall in the parish hall every Tuesday at 10am. Zumba Gold modifies the pace and the moves of regular Zumba classes making them easier for older or less active participants. Zumba Gold is only $5 per person. If you haven’t tried Zumba yet because you thought you might not be able to keep up, this is your chance to get in on the fun! Call Marie (696-8169) for more information. We are about to begin another session of Zumba Toning, which uses weights for body sculpting. Each series of Zumba Toning classes lasts for 6 weeks and has a limited class size. Classes begin on Monday, April 8th, at 6pm. The cost is $30 for the entire 6-week session. 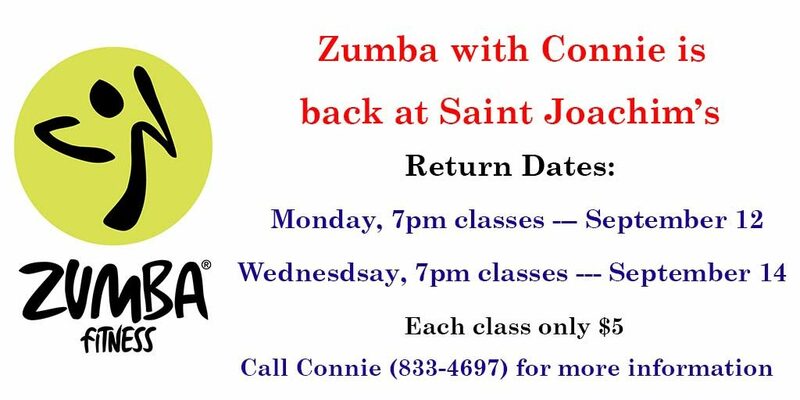 If you are interested in getting your name on the list for our April session, or just want some more information about Zumba Toning, call Connie (833-4697) or Marie (696-8169). Zumba Gold has been cancelled today, Tuesday, February 19th due to a funeral at the church. Zumba Gold resumes next Tuesday, February 26th at 10am. Due to the snow and freezing rain, tonight’s (December 10) Monday night Zumba class has been cancelled. See you Tuesday morning at 10am for Zumba Gold, and Wednesday night at 7pm for Zumba.